MS5145 Eclipse, Keyboard wedge kit, includes PS/2 cable, power supply and user's manual. Stand not included. See accessories. Color: Black. MS5145 Eclipse, SCANNER ONLY: 1D Laser, RS-232 Interface. Color: Black. Stand and interface cables not included. MS5145 Eclipse, SCANNER ONLY: 1D Laser, RS-232 Interface. Color: Gray. Stand and interface cables not included. MS5145 Eclipse, SCANNER ONLY: 1D Laser, USB interface. Stand and interface cables not included. Color: Black. For full kit see: (Part# MK5145-31A38). MS5145 Eclipse, USB Kit, 1D Laser, Includes 5' USB cable. Color: Gray. European configuration. MS5145 Eclipse, RS-232 Serial Kit, 1D Laser. 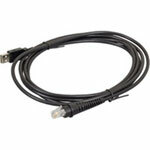 Includes Rs-2323 Serial cable and power supply. Color: Black. MS5145 Eclipse, USB Kit, 1D Laser. Includes 5' straight USB cable. Color: Black.